Acta Pharmaceutica Sciencia (Acta Pharm. Sci. 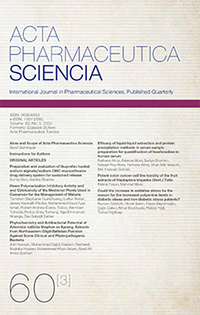 ), formerly known as Bulletin of Pharmacy and Acta Pharmaceutica Turcica is a peer-reviewed scientific journal publishing current research and reviews covering all fields of pharmaceutical sciences since 1953. The original studies accepted for publication must be unpublished work and should contain data that have not been published elsewhere as a whole or a part. The reviews must provide critical evaluation of the state of knowledge related with the subject. All manuscripts has to be written in clear and concise English. Starting from 2016, the journal will be issued quarterly both in paper and on-line formates also publish special issues for national or international scientific meetings and activities in the coverage field. Manuscripts can be submitted as Research Articles and Reviews. 1.2.1 Research Articles are definitive accounts of significant, original studies. They are expected to present important new data or provide a fresh approach to an established subject. 1.2.2 Reviews integrate, correlate, and evaluate results from published literature on a particular subject. They expected to report new and up to date experimental findings. They have to have a well-defined theme, are usually critical, and may present novel theoretical interpretations. Up to date experimental procedures may be included. Reviews are usually submitted at the invitation of the Editors. However, experts are welcome to contact the Editors to ensure that a topic is suitable. Approval is recommended prior to submission. Authors should submit only original work that has not been previously published and is not under consideration for publication elsewhere. Academic theses, including those on the Web or at a college Web site, are not considered to be prior publication. Authors need to resolve all patent and intellectual property issues. Acceptance and publication will not be delayed for pending or unresolved issues of this type. Note that Accepted manuscripts and online manuscripts are considered as published documents. Editors, reviewers, and authors are expected to adhere to internationally accepted criteria’s for scientific publishing. 1.5.1 Author Consent. Submitting authors are reminded that consent of all coauthors must be obtained prior to submission of manuscripts. If an author is removed after submission, the submitting author must have the removed author consent to the change by e-mail or faxed letter to the assigned Editor. 1.5.2. Plagiarism. Manuscripts must be original with respect to concept, content, and writing. It is not appropriate for an author to reuse wording from other publications, including one's own previous publications, whether or not that publication is cited. Suspected plagiarism should be reported immediately to the editorial office. Report should specifically indicate the plagiarized material within the manuscripts. Acta Pharmaceutica Sciencia uses iThenticate or Turnitin software to screen submitted manuscripts for similarity to published material. Note that your manuscript may be screened during the submission process. 1.5.3. Use of Human or Animal Subjects. For research involving biological samples obtained from animals or human subjects, editors reserve the right to request additional information from authors. Studies submitted for publication approval must present evidence that the described experimental activities have undergone local institutional review assessing safety and humane usage of study subject animals. In the case of human subjects authors must also provide a statement that study samples were obtained through the informed consent of the donors, or in lieu of that evidence, by the authority of the institutional board that licensed the use of such material. Authors are requested to declare the identification or case number of institution approval as well as the name of the licensing committee in a statement placed in the section describing the studies’ Material and Methods. Manuscripts should be kept to a minimum length. Authors should write in clear, concise English, employing an editing service if necessary. For professional assistance with improving the English, figures, or formatting in the manuscript before submission please contact to editorial office by e-mail for suggestions. The responsibility for all aspects of manuscript preparation rests with the authors. Extensive changes or rewriting of the manuscript will not be undertaken by the Editors. A standard list of Abbreviations, Acronyms and Symbols is in section 5. It is best to use the fonts “Times” and “Symbol.” Other fonts, particularly those that do not come bundled with the system software, may not translate properly. Ensure that all special characters (e.g., Greek characters, math symbols) are present in the body of the text as characters and not as graphic representations. Be sure that all characters are correctly represented throughout the manuscript—e.g., 1 (one) and l (letter l), 0 (zero) and O (letter o). All text (including the title page, abstract, all sections of the body of the paper, figure captions, scheme or chart titles, and footnotes and references) and tables should be in one file. Graphics may be included with the text or uploaded as separate files. Manuscripts that do not adhere to the guidelines may be returned to authors for correction. 2.1.1 Articles of all kind. Use page size A4. Vertically orient all pages. Articles of all kind must be double-spaced including text, references, tables, and legends. This applies to figures, schemes, and tables as well as text. They do not have page limitations but should be kept to a minimum length. The experimental procedures for all of experimental steps must be clearly and fully included in the experimental section of the manuscripts. 2.1.2 Nomenclature. It is the responsibility of the authors to provide correct nomenclature. It is acceptable to use semisynthetic or generic names for certain specialized classes of compounds, such as steroids, peptides, carbohydrates, etc. In such a case, the name should conform to the generally accepted nomenclature conventions for the compound class. Chemical names for drugs are preferred. If these are not practical, generic names, or names approved by the World Health Organization, may be used. · The ACS Style Guide; Coghill, A. M., Garson, L. R., Eds. ; American Chemical Society: Washington DC, 2006. · Enzyme Nomenclature; Webb, E. C., Ed. ; Academic Press: Orlando, 1992. · IUPHAR database of receptors and ion channels (http://www.guidetopharmacology.org/). · Once in the manuscript title, when placed in parentheses AFTER the chemical or descriptive name. · Once in the abstract. · Once in the text (includes legends) and once to label a structure. Code numbers in the text must correspond to structures or, if used only once, the chemical name must be provided before the parenthesized code number, e.g., “chemical name (JEM-398).” If appearing a second time in the text, a bold Arabic number must be assigned on first usage, followed by the parenthesized code number, e.g., “1 (JEM-398).” Subsequently, only the bold Arabic number may be used. All code numbers in the text must have a citation to a publication or a patent on first appearance. Compounds widely employed as research tools and recognized primarily by code numbers may be designated in the manuscript by code numbers without the above restrictions. Their chemical name or structure should be provided as above. Editors have the discretion of determining which code numbers are considered widely employed. 2.1.4 Trademark Names. Trademark names for reagents or drugs must be used only in the experimental section. Do not use trademark or service mark symbols. 2.1.5 Interference Compounds. Active compounds from any source must be examined for known classes of assay interference compounds and this analysis must be provided in the General Experimental section. Many of these compounds have been classified as Pan Assay Interference Compounds (PAINS; see Baell & Holloway, J. Med. Chem. 2010, 53, 2719-2740). These compounds shown to display misleading assay readouts by a variety of mechanisms by forming reactive compounds. Provide firm experimental evidence in at least two different assays that reported compounds with potential PAINS liability are specifically active and their apparent activity is not an artifact. 2.2.1 Title Page. Title: The title of the manuscript should reflect the purposes and findings of the work in order to provide maximum information in a computerized title search. Minimal use of nonfunctional words is encouraged. Only commonly employed abbreviations (e.g., DNA, RNA, ATP) are acceptable. Code numbers for compounds may be used in a manuscript title when placed in parentheses AFTER the chemical or descriptive name. Authors' Names and Affiliations: The authors' full first names, middle initials, last names, and affiliations with addresses at time of work completion should be listed below the title. The name of the corresponding author should be marked with an asterisk (*). 2.2.2 Abstract and keywords. Articles of all types must have an abstract following the title page. The maximum length of the Abstract should be 150 words, organized in a findings-oriented format in which the most important results and conclusions are summarized. Code numbers may be used once in the abstract. After the abstract, a section of Keywords not more than five has to be given. Be aware that the keywords, chosen according to the general concept, are very significant during searching and indexing of the manuscripts. 2.2.3 Introduction. The rationale and objectives of the research should be discussed in this section. The background material should be brief and relevant to the research described. 2.2.4. Methodology. Materials, synthetic, biological, demographic, statistical or experimental methods of the research should be given detailed in this section. The authors are free to subdivide this section in the logical flow of the study. For the experimental sections, authors should be as concise as possible in experimental descriptions. General reaction, isolation, preparation conditions should be given only once. The title of an experiment should include the chemical name and a bold Arabic identifier number; subsequently, only the bold Arabic number should be used. Experiments should be listed in numerical order. Molar equivalents of all reactants and percentage yields of products should be included. A general introductory section should include general procedures, standard techniques, and instruments employed (e.g., determination of purity, chromatography, NMR spectra, mass spectra, names of equipment) in the synthesis and characterization of compounds, isolates and preparations described subsequently in this section. Special attention should be called to hazardous reactions or toxic compounds. Provide analysis for known classes of assay interference compounds. 2.2.5 Results and Discussion. This section could include preparation, isolation, synthetic schemes and tables of biological and statistical data. The discussions should be descriptive. Authors should discuss the analysis of the data together with the significance of results and conclusions. An optional conclusions section is not required. 2.2.6 Ancillary Information. Include pertinent information in the order listed immediately before the references. Corresponding Author Information: Provide telephone numbers and email addresses for each of the designated corresponding authors. Present/Current Author Addresses: Provide information for authors whose affiliations or addresses have changed. Author Contributions: Include statement such as "These authors contributed equally." Acknowledgment: Authors may acknowledge people, organizations, and financial supporters in this section. Abbreviations Used: Provide a list of nonstandard abbreviations and acronyms used in the paper, e.g., YFP, yellow fluorescent protein. Do not include compound code numbers in this list. It is not necessary to include abbreviations and acronyms from the Standard Abbreviations and Acronyms listed in section 4. 2.2.7 References and Notes. Number literature references and notes in one consecutive series by order of mention in the text. Numbers in the text are non-parenthesized superscripts. The accuracy of the references is the responsibility of the author. List all authors; do not use et al. Provide inclusive page numbers. Titles may have capitalization of first word only (excluding, for example, acronyms and trade names) or standard capitalization as shown below. The chosen style should be used consistently throughout the references. Double-space the references using the following format. · For journals: Rich, D. H.; Green, J.; Toth, M. V.; Marshall, G. R.; Kent, S. B. H. Hydroxyethylamine Analogues of the p17/p24 Substrate Cleavage Site Are Tight Binding Inhibitors of HIV Protease. J. Med. Chem. 1990, 33, 1285-1288. · For online early access: Rubner, G.; Bensdorf, K.; Wellner, A.; Kircher, B.; Bergemann, S.; Ott, I.; Gust, R. Synthesis and Biological Activities of Transition Metal Complexes Based on Acetylsalicylic Acid as Neo-Anticancer Agents. J. Med. Chem. [Online early access]. DOI: 10.1021/jm101019j. Published Online: September 21, 2010. · For periodicals published in electronic format only: Author 1; Author 2; Author 3; etc. Title of Article. Journal Abbreviation [Online] Year, Volume, Article Number or other identifying information. · For monographs: Casy, A. F.; Parfitt, R. T. Opioid Analgesics; Plenum: New York, 1986. List submitted manuscripts as “in press” only if formally accepted for publication. Manuscripts available on the Web with a DOI number are considered published. For manuscripts not accepted, use “unpublished results” after the names of authors. Incorporate notes in the correct numerical sequence with the references. Footnotes are not used. 2.2.8 Tables. Tabulation of experimental results is encouraged when this leads to more effective presentation or to more economical use of space. Tables should be numbered consecutively in order of citation in the text with Arabic numerals. Footnotes in tables should be given italic lowercase letter designations and cited in the tables as superscripts. The sequence of letters should proceed by row rather than by column. If a reference is cited in both table and text, insert a lettered footnote in the table to refer to the numbered reference in the text. Each table must be provided with a descriptive title that, together with column headings, should make the table self-explanatory. Titles and footnotes should be on the same page as the table. Tables may be created using a word processor’s text mode or table format feature. The table format feature is preferred. Ensure each data entry is in its own table cell. If the text mode is used, separate columns with a single tab and use a return at the end of each row. Tables may be inserted in the text where first mentioned or may be grouped after the references. 2.2.9 Figures, Schemes/Structures, and Charts. The use of illustrations to convey or clarify information is encouraged. Structures should be produced with the use of a drawing program such as ChemDraw. Authors using other drawing packages should, in as far as possible, modify their program’s parameters so that they conform to ChemDraw preferences. Remove all color from illustrations, except for those you would like published in color. Illustrations may be inserted into the text where mentioned or may be consolidated at the end of the manuscript. If consolidated, legends should be grouped on a separate page(s). Include as part of the manuscript file. 1. The preferred submission procedure is to embed graphic files in a Word document. It may help to print the manuscript on a laser printer to ensure all artwork is clear and legible. 2. Additional acceptable file formats are: TIFF, PDF, EPS (vector artwork) or CDX (ChemDraw file). If submitting individual graphic files in addition to them being embedded in a Word document, ensure the files are named based on graphic function (i.e. Scheme 1, Figure 2, Chart 3), not the scientific name. Labeling of all figure parts should be present and the parts should be assembled into a single graphic. EPS files: Ensure that all fonts are converted to outlines or embedded in the graphic file. The document settings should be in RGB mode. NOTE: While EPS files are accepted, the vector-based graphics will be rasterized for production. Please see below for TIFF file production resolutions. · The RGB and resolution requirements are essential for producing high-quality graphics within the published manuscript. Graphics submitted in CMYK or at lower resolutions may be used; however, the colors may not be consistent and graphics of poor quality may not be able to be improved. · Most graphic programs provide an option for changing the resolution when you are saving the image. Best practice is to save the graphic file at the final resolution and size using the program used to create the graphic. 4. Graphics should be sized at the final production size when possible. Single column graphics are preferred and can be sized up to 240 points wide (8.38 cm.). Double column graphics must be sized between 300 and 504 points (10.584 and 17.78 cm’s). All graphics have a maximum depth of 660 points (23.28 cm.) including the caption (please allow 12 points for each line of caption text). Consistently sizing letters and labels in graphics throughout your manuscript will help ensure consistent graphic presentation for publication. 2.2.10 Image Manipulation. Images should be free from misleading manipulation. Images included in an account of research performed or in the data collection as part of the research require an accurate description of how the images were generated and produced. Apply digital processing uniformly to images, with both samples and controls. Cropping must be reported in the figure legend. For gels and blots, use of positive and negative controls is highly recommended. Avoid high contrast settings to avoid overexposure of gels and blots. For microscopy, apply color adjustment to entire image and note in the legend. When necessary, authors should include a section on equipment and settings to describe all image acquisition tools, techniques and settings, and software used. All final images must have resolutions of 300 dpi or higher. Authors should retain unprocessed data in the event that the Editors request them. 2.3.1 Biological Data. Quantitative biological data are required for all tested compounds. Biological test methods must be referenced or described in sufficient detail to permit the experiments to be repeated by others. Detailed descriptions of biological methods should be placed in the experimental section. Standard compounds or established drugs should be tested in the same system for comparison. Data may be presented as numerical expressions or in graphical form; biological data for extensive series of compounds should be presented in tabular form. Active compounds obtained from combinatorial syntheses should be resynthesized and retested to verify that the biology conforms to the initial observation. Statistical limits (statistical significance) for the biological data are usually required. If statistical limits cannot be provided, the number of determinations and some indication of the variability and reliability of the results should be given. References to statistical methods of calculation should be included. Doses and concentrations should be expressed as molar quantities (e.g., mol/kg, μmol/kg, M, mM). The routes of administration of test compounds and vehicles used should be indicated, and any salt forms used (hydrochlorides, sulfates, etc.) should be noted. The physical state of the compound dosed (crystalline, amorphous; solution, suspension) and the formulation for dosing (micronized, jet-milled, nanoparticles) should be indicated. For those compounds found to be inactive, the highest concentration (in vitro) or dose level (in vivo) tested should be indicated. · whether the cell line has recently been tested for mycoplasma contamination. 2.3.2 Purity of Tested Compounds. Methods: All scientifically established methods of establishing purity are acceptable. If the target compounds are solvated, the quantity of solvent should be included in the compound formulas. No documentation is required unless asked by the editors. Purity Percentage: All tested compounds, whether synthesized or purchased, should possess a purity of at least 95%. Target compounds must have a purity of at least 95%. In exceptional cases, authors can request a waiver when compounds are less than 95% pure. For solids, the melting point or melting point range should be reported as an indicator of purity. Elemental analysis: Found values for carbon, hydrogen, and nitrogen (if present) should be within 0.4% of the calculated values for the proposed formula. 2.3.3 Confirmation of Structure. Adequate evidence to establish structural identity must accompany all new compounds that appear in the experimental section. Sufficient spectral data should be presented in the experimental section to allow for the identification of the same compound by comparison. Generally, a listing of 1H or 13C NMR peaks is sufficient. However, when the NMR data are used as a basis of structural identification, the peaks must be assigned. List only infrared absorptions that are diagnostic for key functional groups. If a series contains very closely related compounds, it may be appropriate merely to list the spectral data for a single representative member when they share a common major structural component that has identical or very similar spectral features. 3.2 Registration to System It is required to register into the e-Collittera system for the first time while entering by clicking “Create Account” button on the registration screen and the fill the opening form with real information. Some of the information required in form is absolutely necessary and the registration will not work if these fields are not completely filled. After the registration, a “Welcome” mail is sent to the user by the system automatically reminding user name and password. Authors are expected to return to the entry screen and log on with their user name and password for the submission. Please use only English characters while determining your username and password. If you already registered into the e-Collittera system and forget your password, you should click on “Forgot My Password” button and your user name and password will be mailed to your e-mail in a short while. 3.3 Submitting A New Article The main page of author module consists of various parts showing the situation of manuscripts in process. By clicking the New Manuscript button, authors create the beginning of new submission, a process with a total of 9 consecutive levels. In first 7 levels, information such as the article’s kind, institutions, authors, title, summary, keywords etc. are asked respectively as entered. Authors can move back and forth while the information is saved automatically. If the is transaction is discontinued, the system move the new submission to “Partially Submitted Manuscripts” part and the transaction can be continued from here. 3.1.1 Sort of Article Authors should first select the type of article from the drop down menu. Warning. If “Return to Main Page” button is clicked after this level, the article automatically assined as “Partially Submitted Manuscripts”. 3.2.2 Institutions Authors should give their institutional information during submission. 3.2.3 Authors The authors’ surnames, names, institutional information appear as entered order in the previous page. Filling all e-mail adresses are required. Institutional information is available in Manuscript Details table at the top of the screen. After filling all required fields, you may click the Continue button. 3.2.4 Title should be English, explaining the significance of the study. If the title includes some special characters such as alpha, beta, pi or gamma, they can easily be added by using the Title window. You may add the character by clicking the relevant button and the system will automatically add the required character to the text. Warning. No additions to cornered parenthesis are allowed. Otherwise the system will not be able to show the special characters. 3.2.5 Abstract The summary of the article should be entered to Abstract window at this level. There must be an English summary for all articles and the quantity of words must be not more than 150. If special characters such as alpha, beta, pi or gamma are used in summary, they can be added by Abstract window. You may add the character by clicking the relevant button and the system will automatically add the required character to the text. The abstract of the articles are accessible for arbitrators; so you should not add any information related to the institutions and authors in this summary part. Otherwise the article will returned without evaluation. Authors will be required to comply with the rules. 3.2.6 Keywords There must be five words to define the article at the keywords window, which will diverged with commas. Authors should pay attention to use words, which are appropriate for “Medical Subjects Headings” list by National Library of Medicine (NLM). 3.2.7 Cover Letter If the submitting article was published as thesis and/or presented in a congress or elsewhere, all information of thesis, presented congress or elsewhere should be delivered to the editor and must be mentioned by the “Cover Letter” field. 3.3.1 Adding Article This process consists four different steps beginning with the loading of the article in to system. Browse button is used to reach the article file, under the Choose a file to upload tab. After finding the article you may click to Choose File and file will be attached. Second step is to select the file category. Options are: Main Document, Black and White Figure, Color Figure and Video. The explanation of the files (E.g.. Figure 1, Full Text Word File, supplements etc.) should be added on third step and the last step is submitting the prepared article into the system. Therefore, Download button under the Send your file by clicking on download button tab is clicked. Reminder If the prepared article includes more than one file (such as main document, black and white figure, video), the transaction will be continued by starting from the first step. The image files must be in previously defined format. After all required files were added, Continue button should be clicked. All details and features of the article might be reached from the Article Information page. This page is the last step of the transaction which ensures that entered information is controlled. 3.3.2 Your Files After adding the article you may find all information related to article under Your Files window. File Information This window includes file names, sizes, forming dates, categories, order numbers and explanations of files. The details about the files can be reached by clicking on Information button. If you click on Name of File, the file download window will be opened to reach the copy of the file in system. File Download This window submits two alternatives, one of them is to ensure the file to be opened in valid site and the second one is to ensure to download submitted file into the computer. Opening the Category part on fourth column can change the category of the file. Opening the Order column on fifth column can change the order of file. The file can be deleted by clicking on Delete button on the last column. Before deleting, system will ask the user again if it’s appropriate or not. 3.3.3 Sending Article Last level is submitting the article and the files into the system. Before continuing the transaction, Article Information window must be controlled where it is possible to return back; by using Previous button and required corrections can be made. If not, clicking the Send the Article button completes transaction. 3.3.4 Page to Follow The Article The Main Page of Author ensures possibility to follow the article. This page consists three different parts; some information and bridges related to the sent articles, revision required articles and the articles that are not completed to be sent. 3.3.4.1 Articles Not Completed to be Sent After the sending transaction was started, if article is not able to continue until the ninth step or could not be sent due to technical problems shown at this part. Here you can find the information such as the article’s number which is assigned by system, title and formation date. You may delete the articles by using Delete button on the right column, if the article is not considered to send into the system. 3.3.4.2 Articles That Require Revision Articles, which were evaluated by the referee and accepted by the editor with revision, continues to Waiting for Revision table. The required revisions can be seen in “Notes” part by clicking the articles title. In order to send any revision, Submit Revision button on the last column should be clicked. This connection will take the author to the first level of Adding Article and the author can complete the revision transaction by carrying out the steps one by one. All changes must be made in the registered file and this changed file must be resent. Author’s most efficacious replies relating to the changes must be typed in “Cover Letter” part. If the is transaction is discontinued, the system move the revised article to Submitted Manuscripts part and the transaction can be continued from here. After the transaction was completed, the system moves the revised article to “Submitted Manuscripts” part. 3.3.5 Submitted Manuscripts Information related to articles can be followed through the Submitted Manuscripts line. Here you can find the information such as the article’s number assigned by system, title, sending date and transaction situation. The Manuscript Details and summary files can be reached by clicking the title of the article and the Processing Status part makes it possible to follow the evaluation process of the article.